When was the last time you used your cellphone? Was it 10 minutes ago? Five minutes ago? Are you reading this on your cellphone right now? But beyond having fun and Googling answers to your burning questions, technology apps and gadgets have made quite the impression in the travel and automotive industries. On the seas, robotic bartenders mix cocktails and facial recognition software will soon have you boarding ships without ever waiting in line. On the streets, advanced driver assistance features in new cars can kick in to help you avoid a car crash. Others can even park your car for you! We here at Your AAA have been tracking the latest travel tech and car tech trends. 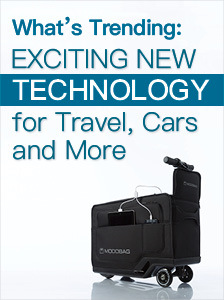 That’s why we have written this special guide, What’s Trending: Exciting New Technology for Travel, Cars and More. Download it now! From virtual reality travel apps and car connection to ride-on luggage and must-listen podcasts, this guide covers it all. And unlike other technology guides, this one includes travel and car safety advice from experts you can trust at AAA. AAA knows cars. We also know travel. So if you’re wondering why we have written a guide on technology, the answer is simple. Cars and travel have become incredibly high-tech, and AAA has kept a close eye on which gadgets and apps can make your life easier. This guide comes from the car and travel experts at Your AAA. It’s detailed, thorough and easy to understand. What’s Trending: Exciting New Technology for Travel, Cars and More belongs in every home that travels, drives and stays connected with the technology of today. This guide is filled with exciting apps you can try before and during your next vacation. You can learn about cutting-edge virtual reality technology that gives you the ability to see the world from the comfort of your couch. It’s an incredible capability that can truly help you plan your next vacation. You work hard for your money, so why not know that your next trip will live up to the billing! Confused about self-driving cars and the features that propel them? This guide also dives into the latest advancements in autonomous car features and when you can expect to see them roll out at a dealership near you. There are many concerns about the safety of such vehicles, and you can bet Your AAA is on top of not just the benefits, but potential dangers with these systems, too. In addition to giving you the low-down on the latest travel gadgets and apps, this FREE guide will explain the many recent advancements in car tech. For instance, did you know that backup cameras and automatic emergency braking features will soon come standard in new vehicles? And have you heard of night vision? No, we’re not talking about superheroes here. Many new cars are outfitted with night vision pedestrian detection, which can really help city drivers and pedestrians stay safe. You’ll also learn about how technology is changing the hotel and hospitality industries. Here’s a hint: In a few years, there could be a new generation that doesn’t ever remember using a room key! The only thing holding you back from an exciting outdoor adventure is the weather – and possibly a fear of heights. But if you are one who enjoys and outdoor jaunt, then check out the apps for adventurous travel section inside this FREE guide. Read about photography editing apps that make Instagram seem soooo 2017. You can also read about high-tech glasses you wear that will shoot your vacation videos for you as you freely enjoy your hike or walking tour. How futuristic! We’ll teach you about the latest adventure travel trends, including geocaching – a virtual worldwide scavenger hunt that can make even the tamest hiking trail an amazing adventure. By the time you’ve finished reading this guide, AAA will have you telling all your friends about the coolest new apps and features coming to cars and travel! And remember, all this technology is designed to make your life better and more convenient. Seize the day the high-tech way with all the exciting new gadgets and apps included in this FREE guide from AAA. So I hope you’ll take some good advice and download What’s Trending right now. Remember, it’s absolutely free. Print it off and read some now and even more later. You won’t regret it! So whether you’re a longtime AAA member, or you’ve heard of us but never experienced the benefits of our expertise, you can take advantage of this offer right now – and be reading your AAA technology guide in moments! Get What’s Trending: Exciting New Technology for Travel, Cars and More right now, and save yourself time, money and stress! PS: If technology isn’t your thing, or you feel like you have had too much of it in your life lately, you are not alone. Download the guide to read about how to know when you need a digital detox and for fun activities to do with your family when you need to unplug for a while.